Northwest Seed & Pet, Inc.
From secure online shopping to professional production and order fulfillment, Zome has you covered. Fundraising has never been easier with your own personalized e-store by Zome Design. Why Choose Zome's Custom Merchandise E-Store? We give you the ability to launch your own online merchandise storefront with no need for a web developer, payment gateway or any of the other hassles of creating an e-commerce store. Multiple pricing formulas allow you to earn up to 20% commission for your organization. Perfect for fundraising! Security is our top concern. You can always trust your information with Zome. We follow the latest industry standards to remain PCI Compliant. Whether you need 1 or 100,000+ pieces, our multiple production facilities can handle the job. Choose from a full line of t-shirts, sweats, hats, polos, jackets, bags & more for your e-store. All available with no minimum purchase. Promotional products are also available. Our customer service team handles all phone calls, e-mails and order issues giving you more time to do the things you need to do. Let us handle the details. The shirts arrived on time and look amazing! Thank you very much." We take the hassles out of group ordering. 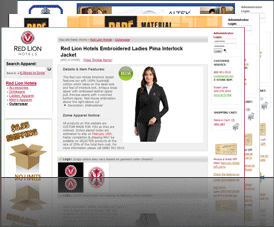 Allow your group's individuals to place their orders online in one central place. At the end of the sales event we produce and ship the items to you. Give your group the ability to have an online registration system for your next big event. We collect all the data and provide it in an easy to use excel spreadsheet. Easily customize your registration form to your event's specific needs. Access sales, production & commission data in real time. Every page we develop is designed with search engines in mind. From meta tags to copywriting, we do our best to get your products seen. Our designers build your store to match your current website, with custom background and text colors, as well as custom banners. Offer multiple logos for each product along with custom name drops for individuals, teams or departments.